In this digest of 3D printing news, we slice news involving: LPW Technology, Aerojet Rocketdyne, ZMorph, Lulzbot, Protosthetics, HP, EnvisionTEC, Exact Metrology, Novacopy, Arconic and University College London. 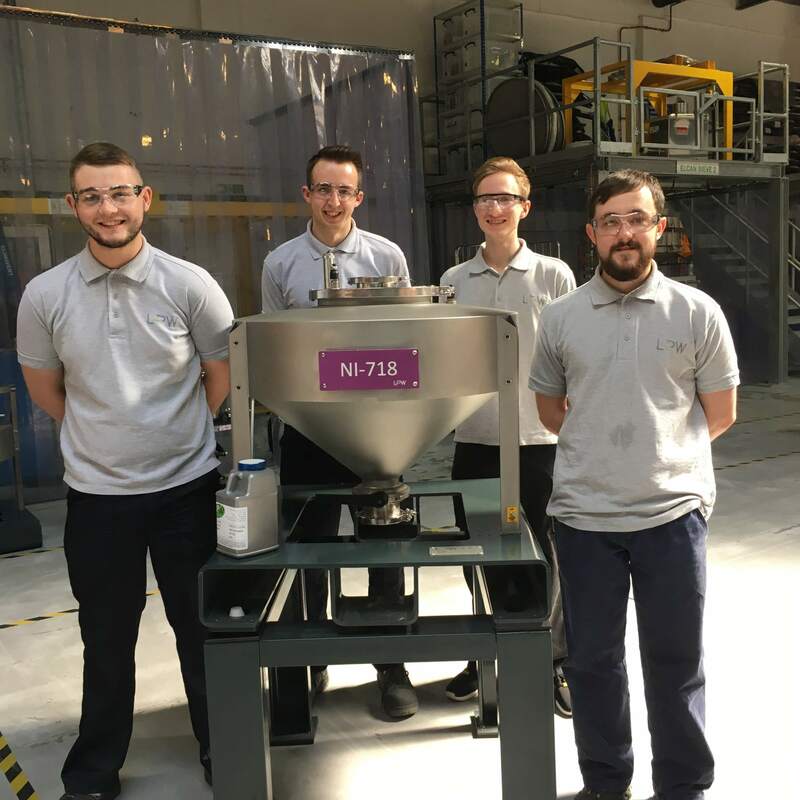 Founded in 2007, British powder company LPW Technology is celebrating its 10 year anniversary of working in additive manufacturing. Initially a “one-man operation,” consisting of just the founder Dr. Phil Carroll, the company now employs 74 people with 54 of which added in the last two years. LPW will also move to a new $20 million facility later this year and hopes to bring the number of employees at the company up to 120 by 2019. LPW Technology has also begun a partnership with US 3D printing company Stratasys following a $25 million investment. LPW’s 2017 apprenticeship team with an original powder container. Photo via LPW Technology. 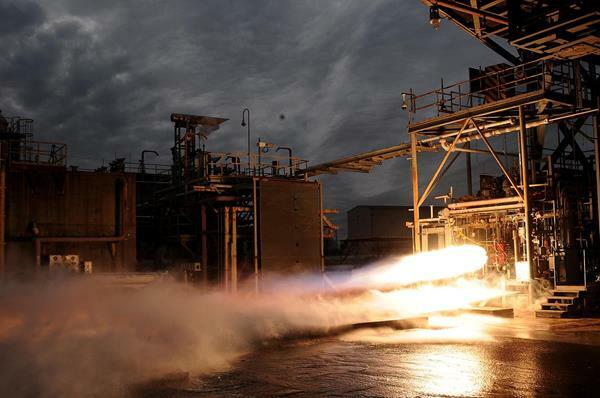 Californian rocket company Aerojet Rocketdyne has announced its latest 3D printed rocket engine has been successfully hot-fire tested. The 30,000 lbf thrust-class Bantam liquid-fuelled rocket engine was built with 3D printing and achieved a 500 percent increase in thrust level in relation to its smaller sibling, the ‘Baby Bantam’ engine which was fully 3D printed back in 2014. This larger scale Bantam rocket engine is built from just three additive manufactured parts, the injector assembly, the combustion chamber, and the throat and nozzle section. While conventionally, the rocket would require 100 different parts, these three 3D printed parts were welded to create a single assembly. Aerojet Rocketdyne also reached an important milestone in the development of the AR1 engine which bids to replace the Russian made RD-180 engine. The full-size Bantam rocket engine tested at NASA Marshall Space Flight Center. Photo via Aerojet Rocketdyne. Based in New York, engineering materials company Arconic has announced the creation of a worldwide advanced manufacturing education program. Through this program, which Arconic has invested $600,000, 375 students are expected to be educated in the next two years across the United States, Germany, Hungary, and the UK. Arconic hope to encourage more students to pursue careers in manufacturing and address the sudden shift occurring in the manufacturing techniques. Perhaps these future engineers will work on the construction of Arconic’s smog eating skyscraper. 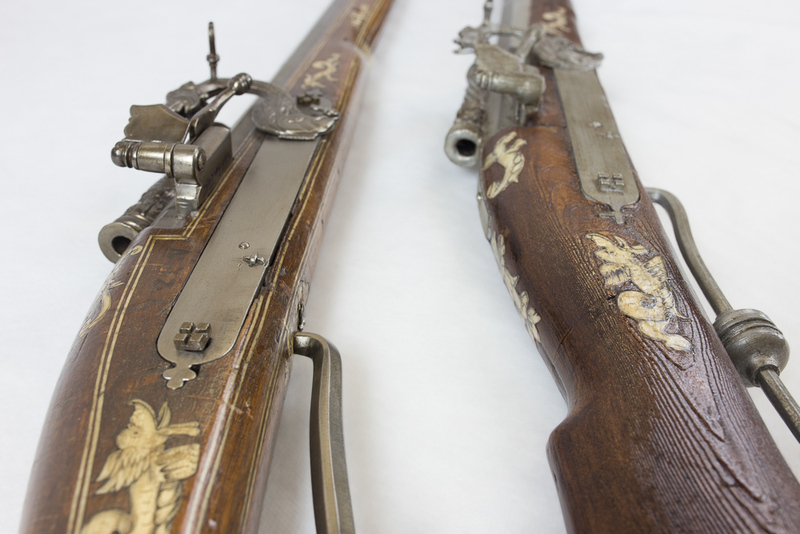 The National museum in Poznan, Poland contracted Polish 3D printing bureau Get Models Now to create a realistic rifle replica from the 16th Century. The gun was scanned with Artec scanners and then printed using a ZMorph 2.0 SX multitool 3D printer. The rifle was printed in PLA and Colorfabb‘s Woodfill filament and given considerable finishing to create the realistic replica. The object which contains a lead rod in its centre to give similar weight, will be used by the museum for demonstration and in order to preserve the original. The 3D printed rifle (right) and the original (left). Photo via ZMorph. 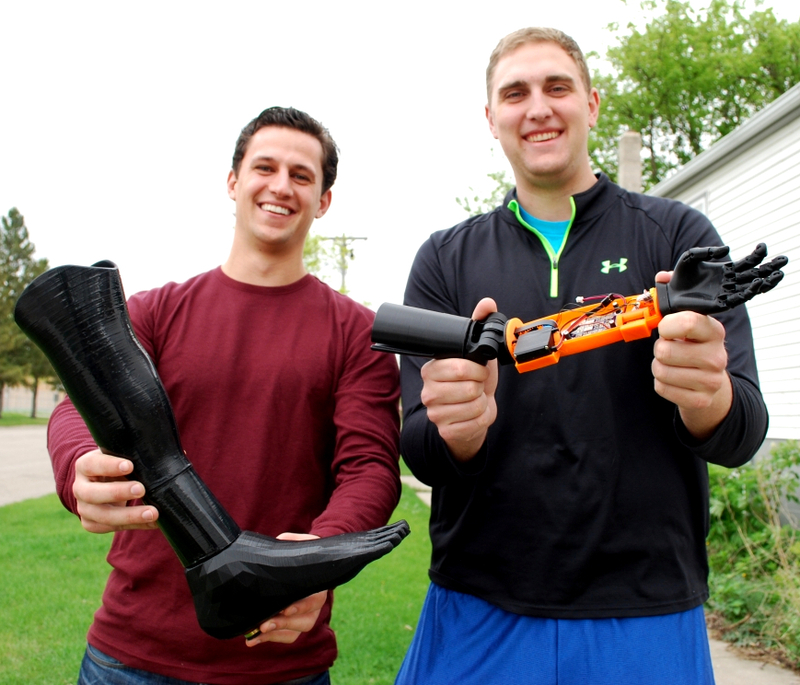 Headquartered in Fargo, North Dakota company Protosthetics is using 3D printing to create bespoke prosthesis and orthotics. The company has incorporated nearly a dozen Lulzbot 3D printers into the production workflow and commended the open source nature of the hardware. The benefit of having the LulzBot 3D printers for us has really been the fact that not only are they a high-quality, very robust machine to start with but the community and the Open Source nature have allowed us to basically build on top of that and incorporate our own characteristics and functionality. Protosthetics’ Josh Teigen and Cooper Bierscheid. Photo via Lulzbot. Nashville printing company Novacopy has announced it will now be a provider of sales, service and support for the HP Jet Fusion 3D printers. As a full-service provider of 3D Printing and scanning, it’s very exciting to help make customers’ ideas real. And, with the new HP Jet Fusion printers, the world’s first production-ready 3D printing system will certainly reinvent existing ideas and help change the future (not to mention prototyping and short-run manufacturing along the way). HP recently announced a new global strategy to scale-up adoption of the company’s Jet Fusion technology. While elsewhere in the States, metrology equipment supplier Exact Metrology has announced it has become the greater Midwest dealer for EnvisionTEC’s 3D printers and materials. Exact Metrology has offices in Cincinnati, Ohio, and Brookfield, Wisconsin. Dean Solberg, co-president of Exact Metrology said the addition would bring “our line to a new level of technology.” The company recently delved into the 3D printing industry and was impressed by EnvisionTEC’s machines. 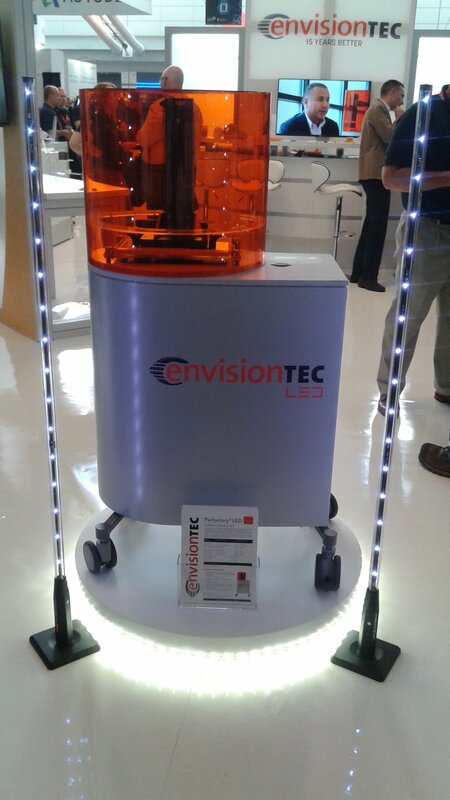 EnvisionTEC develops DLP printers and showcased the latest iteration at RAPID this month. EnvisionTEC’s new LED system. Photo via EnvisionTEC. University College London’s (UCL) Bartlett School of Architecture has used unique software to create an artistic 3D printed chair design. Created at the Design Computational Lab (DCL) at UCL using a robotic arm. The Voxel Chair was designed by Manuel Jimenez Garcia and Gilles Retsin and is currently exhibiting at Centre Pompidou Paris. The robotic arm fabricating the chair. Photo via Design Computation Lab UCL. 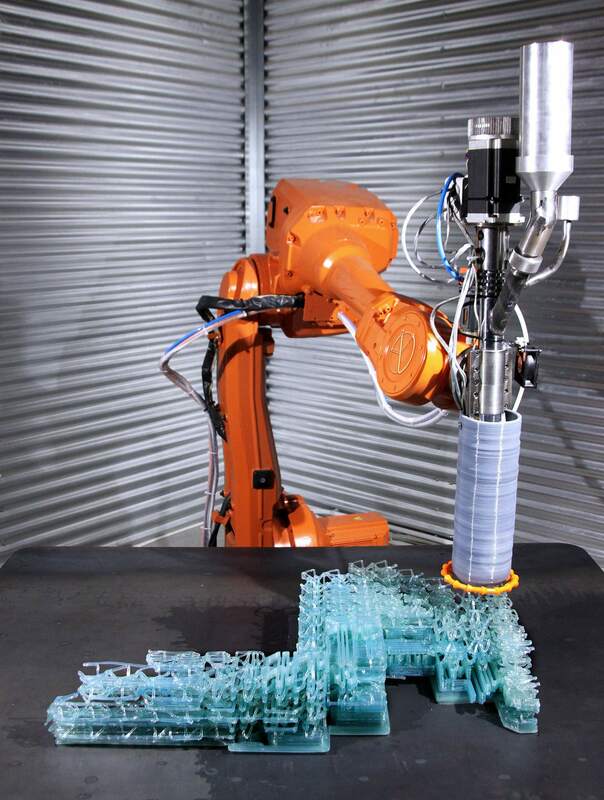 To create the chair, the team at the DCL created the software which allows the robotic arm printer to 3D print one continuous line of plastic. 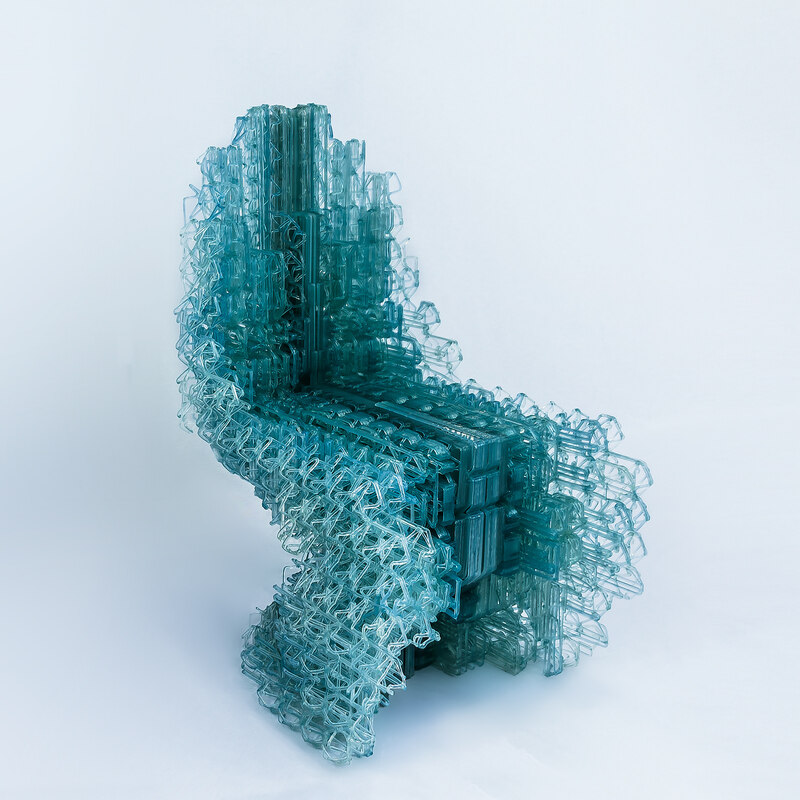 The Voxel Chair v1.0 is a prototype to test the functionality of the software and was printed in transparent biodegradable PLA plastic. Rather than slicing like conventional 3D printing software, DCL’s method allows the user to directly manipulate the printhead’s toolpaths. Featured image shows the Sliced logo over a close up of the Voxel Chair. Image via Design Computational Lab.